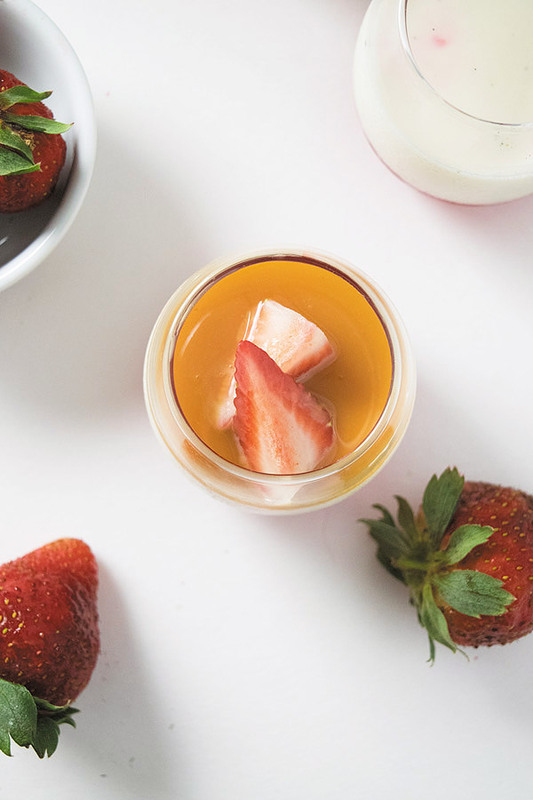 Simple elegant Vanilla Panna Cotta with Strawberry Jello and caramel. It’s so simple to make yet looks super fancy! So I had my first ever Panna Cotta at this fancy Italian restaurant yesterday. I mean I always thought I was never a panna cotta person. I thought it must be tangy sort of like eating a thick greek yogurt but wrong I was! So when we asked the lady what dessert she recommends, she said that creamy vanilla panna cotta is her favorite and they make it the best. We were little skeptical but finally we gave in and thought why not? And I was so happy that we did cause it was sort of like eating a flan but way creamier yet not that rich which was so comforting! And after dinner, I made sure to stop on the way to pick up ingredients to make this and the lady was kind enough to tell me what ingredients they use to make that creamy panna cotta! So here it is a really simple dessert. I gave it a little face lift and added a layer of strawberry jello underneath, then the panna cotta and then I added caramel and some fresh strawberries. I am telling you this dessert you must make and it is so easy! This was my breakfast today and I plan on eating another one too after my dinner tonight! So creamy and if you have pure vanilla beans, then I would suggest use those! Make jello as per package directions. Pour it either in indivisual ramekins or one big pot and let it chill for 4-5 hours until completely set. Make this once jello is set. Warm up 1 tbsp milk and add ½ tbsp gelatin and stir. Keep aside. In a pot heat heavy cream until you start to see little bubbles coming up on the side. Take it off heat and add condensed milk and gelatin mix. Put it back on stove and keep stirring for a minute or two until it's all completely mixed. Now add vanilla bean paste from vanilla bean and mix. Pour it into already set jello ramekins and chill again for another 4-5 hours. Just before serving, add caramel sauce and chopped strawberries. This panna cotta is so pretty, Ami! I’ve never made this dessert before, but I do love it. The strawberry and vanilla flavors go so perfectly together! 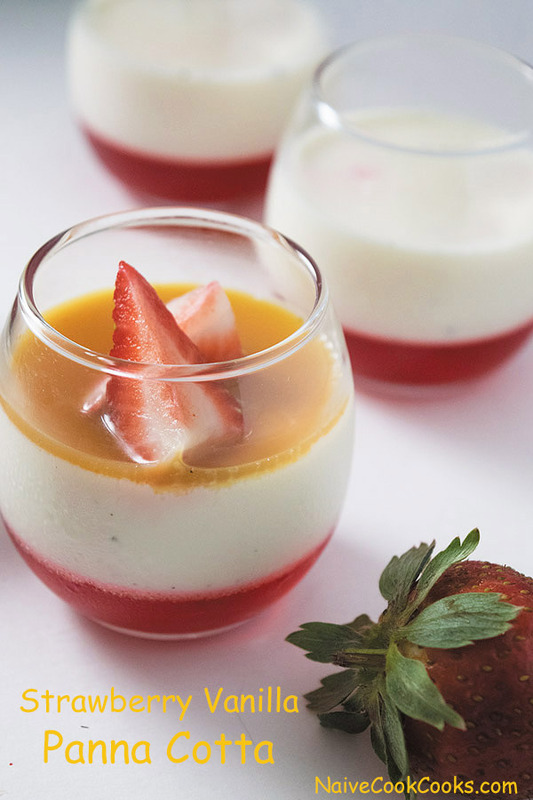 I love layered panna cotta. It’s just so beautiful. Your strawberry version sounds wonderful and it’s so colorful. Definitely a simple yet elegant dessert. 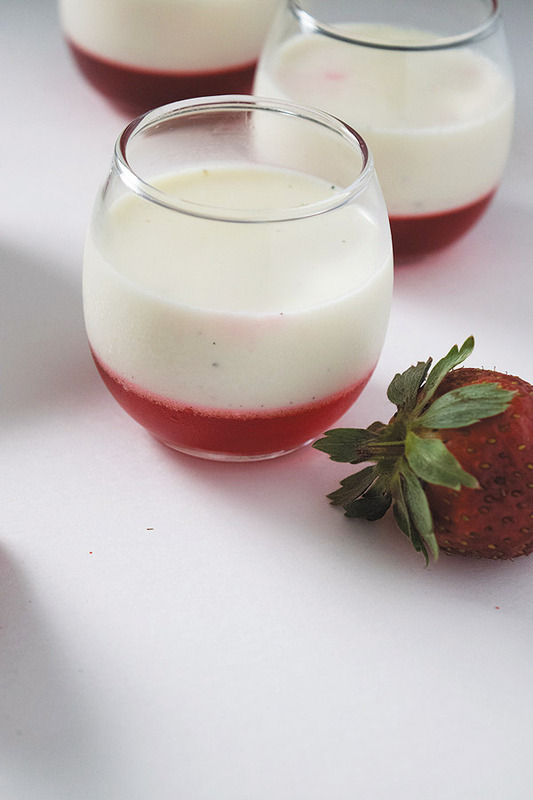 Panna Cotta is such a stunning dessert and also so easy! love this Ami! 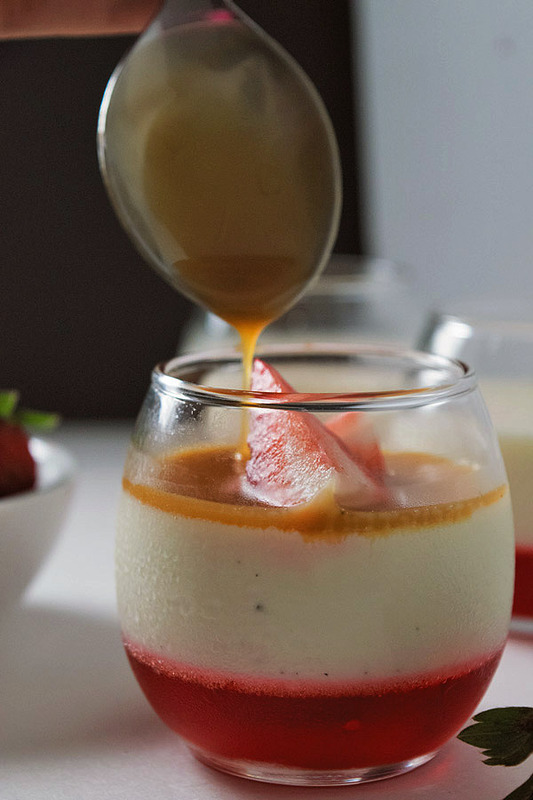 The layers to this panna cotta are so beautiful. Such an elegant dessert!